The geometric patterns of Spanish tiles have created alluring charm in homes for centuries. The photo below showcases a timeless Spanish tile design that was skillfully hand painted over a hundred years ago. Recapture the romance using Avente's Barcelona La Merced Tile. The pattern comes in both a standard 6"x6" format and 6"x6" quarter design, as featured in the photo above and shown here. The Barcelona La Merced Quarter Design with its classic geometry, balance, and ample negative space is a personal favorite. 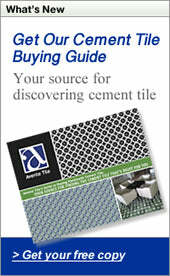 Avente is pleased to provide both the inspiration and tiles for great projects, like the one shown here. Browse our online catalog and re-create the romance of Spain using any of the tiles from our Barcelona Line! Or, call us toll-free at 888.739.4972 (M - F, 9 AM - 5 PM PST).